I shaved the hair on my chin, but it’s grown back. What’s wrong? Posted 11 September 2013 under Ask Us. I have hair below my chin near my neck. I shaved one time but it’s grown back. Why is this happening? Do I have a health problem? Some girls/women of certain cultures have extra or darker hair on their face and neck, and sometimes other parts of their body. Another reason for this is that your body could be making too much of the hormone testosterone. 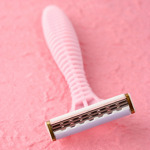 Shaving will remove the unwanted hair temporarily, but it will grow back. It’s a good idea to talk to your health care provider to find out if you have a hormone imbalance, which is common with conditions such as polycystic ovarian syndrome (PCOS). You can also talk to your health care provider about medication that lessens hair growth and safe and permanent ways to remove unwanted hair. Help! I have dark hair on my upper lip and chin. What can I do about it? Quiz: Do I have PCOS?